Hotel Ziggurat is a personally owned, personally run and lovingly looked after boutique hotel in the centre of St Peter Port. Ziggurat is located on Constitution Steps, just three minutes from Market Square and the centre of town. 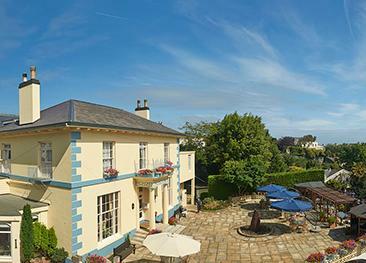 The hotel has amazing views over the harbour and surrounding islands and a very unique, quirky and friendly charm. Holidays for the Hotel Ziggurat for 2019 are currently only available to book by phone. Please call us on 01534 496 660 for assistance. All rooms are en-suite and equipped with hairdryer, television, telephone for internal calls and mini-fridge. A kettle, large red teapot, cafetiere and selection of high-quality teas and coffees are waiting to greet you each morning or evening when you return to your room. The restaurant opens daily offering Moroccan inspired evening meals. 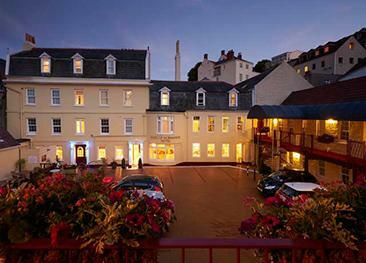 St. Peter Port’s centre is a 3 minute walk down Constitution Steps making the hotel’s location ideal for exploring the many sites of interest, from Castle Cornet in the harbour to Market Square amongst the cobbled streets. The hotel is not suitable for disabled customers. Small dogs are accepted in some bedrooms on a request basis at a charge of £15.00 per dog per night. Dogs are not permitted in the restaurant. 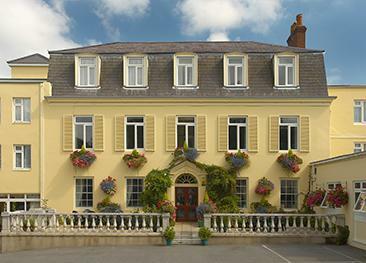 The Duke of Normandie is a 3 star boutique hotel in Guernsey's town centre, featuring a popular bar, a beer garden and a sunny courtyard.